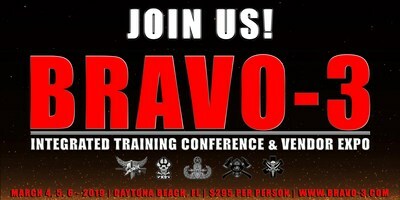 GETTYSBURG, Pa., Jan. 10, 2019 /PRNewswire/ -- Tripwire Operations Group, a renowned tactical security and training academy founded and run by first responders, will host the international BRAVO-3 Training Conference & Vendor Show in Daytona Beach, Fl., March 4-6, 2019. This all-inclusive, multi-discipline event will offer unsurpassed training opportunities for those in all emergency services vocations. "By leveraging the knowledge and experience of the leading experts in the industry, Tripwire is fulfilling its mission to ensure that all practitioners are operating at optimum levels," said Ryan Morris, founder and CEO of Tripwire, headquartered in Gettysburg, Pa.
For more information about attending the BRAVO-3 Conference, visit Tripwire Operations Group at tripwireops.org, or call 717-648-2792. Tripwire Operations Group in Gettysburg, Pa. offers critical and life-saving awareness-level and operational-level courses to help law enforcement and first responders from across the nation and around the world stay informed, prepared, and safe.